In precisely two weeks time, I shall be in Venice. The last time I was there was 2005 – distressing, given how much I love this unique city, la serenissima. And especially shocking, since my sister lives there. Ten years. How is that possible? Well, a lot has happened in the last decade, that’s for sure, but the last time I visited the most breathtaking of Italian cities, it was in order to teach English and web design to students at the Istituto Zuccante in Mestre, which is the bit of Venice on the mainland just a few miles from the more famous part built on the water that everyone knows about. 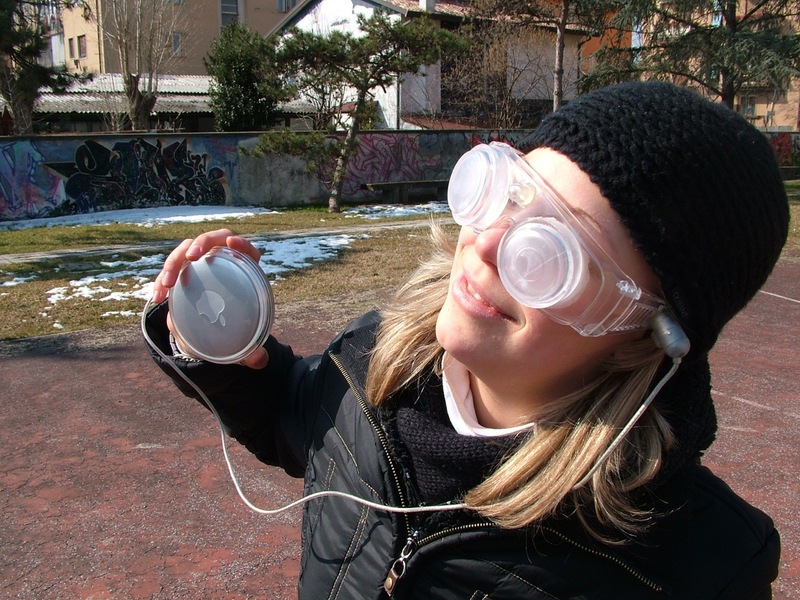 One of my Italian students demonstrates the ‘Eyepod’. If my course sounds unusual to you, you’re right. The idea was to introduce web design to students of mixed abilities at the technical college – in English. However, I quickly realised just how mixed the abilities were, and ended up teaching most of the course in Italian. It was great fun, however, and as always in these situations, I learned as much as I taught. On the left, you can see one of my lovely students demonstrating the purpose of the website they built over the two weeks – to promote the launch of the ‘EyePod’, an invention entirely sourced from my own madness back in 2005. The idea was a 3-D viewing device for watching specially produced mini-DVDs. At the time, I had no idea that it would become possible to do precisely this soon afterwards. (If only I’d patented the idea…) The secret prototype seen here was cobbled together from various objects and lots of superglue – perhaps you can identify some of them! 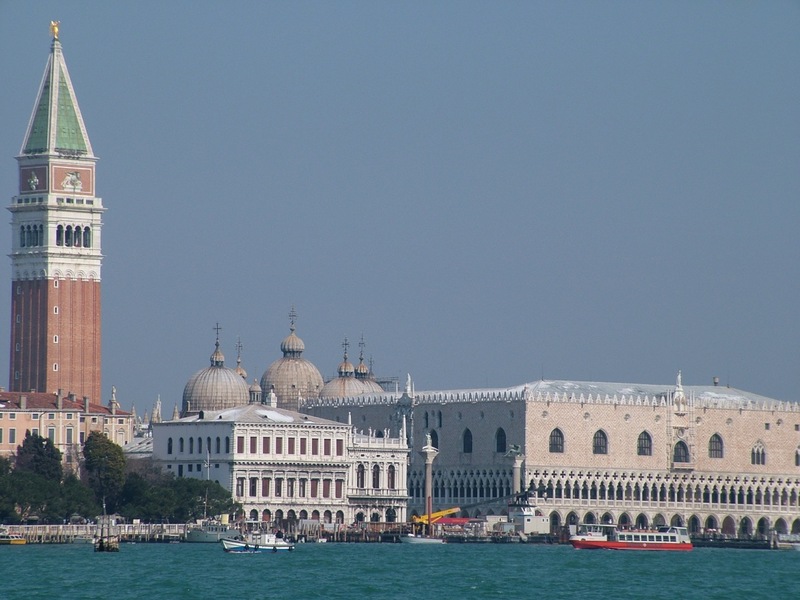 By sheer coincidence, my forthcoming visit to Venice will also have an educational aspect, because my sister Janys is organising a writing retreat on the island of Giudecca and I’m going over to help out for a couple of days. It will also be my pleasant duty to act as guide and chaperone to the wonderful Roz Morris, who will be teaching the course. Not that there will be a huge amount of time for sightseeing – we fly out on the evening of Monday 14th and return on Thursday afternoon. But it will certainly be an adventure and I’m looking forward to it immensely. This is the first time Janys has run one of her creative courses, as she has started the business from scratch this year and the whole thing will be a learning curve for everyone concerned. You can be sure that I’ll return with a full report, including plenty of photos and videos of Roz in action and the students scribbling like mad. Let me leave you with a gallery of photos I took during my last visit, just a tiny selection of the thousands of images I have of this magical place. Buona notte! Year, my dear friend, and it’s going to be wonderful. La Serenissima awaits your presence. I’m really getting excited too and look forward to meeting you all.